Thanks for your great website! I lease an aged (18?) purebred Arabian gelding as a trail horse. (He’s an ex endurance horse, now semi retired) Boy is lovely, forward moving and full of personality. I am thinking of buying him off his owner, however his canter is quite rough and hurts my back. Is there any way of changing this gait in an aged horse, or should I simply accept he is what he is? You can always “teach old dogs new tricks” but at 18 and with the wear and tear of his previous life, Boy’s rough canter might be a result of arthritis more than training. Perhaps he has lost flexion in some part of his body, lumbar/loin area, hocks, stifle………I first am targeting the areas at the rear of the horse that are usually responsible for a smooth, flowing canter. But the problem could also be in the front end – wear and tear (arthritis) in the pasterns, fetlocks and knees. I’d suggest asking your veterinarian to give the horse a specific pre-purchase exam – that is, one that would evaluate his movement and to determine if he is suffering from arthritis or another lameness or unsoundness that causes his rough movement. Your question reads like a story about aging horses and saddle fit. When a horse’s back begins to drop (sway) it is almost impossible to keep the saddle up near the vicinity of the withers. Instead, gravity and the rider’s weight cause the saddle to slip down the slope created by the prominent withers (the peak) and the now lower back. Even if you tighten and re-tighten the cinch, the tendency will be for the saddle and you to slip rearward and settle down in the valley of the horse’s sagging topline. You’ve tried the logical solution – use a breast collar to HOLD the saddle forward. But alas that just causes extreme pressure on the horse’s chest and shoulders as the weight of the saddle and rider pull against them as the saddle tries to slip back. Which brings me to the change in behavior in your horse. You say you always have to keep pulling on her to stop her or slow her down now – you didn’t have to do that in the past. That’s because when a horse has back pain from pressure and/or an ill-fitting saddle and when a horse is thrown off balance because of tight tack and pressure, the horse might instinctively do one of several things. Buck like heck to get rid of the saddle and pain, rub or roll to get the saddle off, or as many trained horses will do, move fast and tense. Part of your mare’s exuberance might be due to her being full of energy, but in so many cases, quick, tense movement is associated with pain and imbalance. So the solution to everything is finding a saddle that fits. This is something you will need to do locally so that the expert saddle fitter can see your horse in person. Once you get a saddle to fit your mare, you might be surprised to see how you will be able to ride with a looser cinch, how much more comfortable your mare will be and how she will resume her normal gaits. If you care to reply with the state or area you live in, perhaps someone will write in suggesting a saddle fit expert in your area. 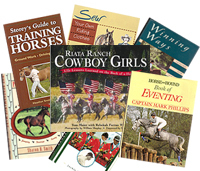 Read more articles on tack and riding here on my Horse Information Roundup. I am a newly developed horse lover and I just wanted to say I read your book “Cherry Hill’s Horsekeeping Almanac”. It was very informative and I enjoyed your insight. In our Public Library that’s all we had on you and your books. The horse selection is very old and few on the shelves here. In the next few years I plan on having a career, or owning a few horses myself. Thank you so much for writing the book and living the life you wanted. Your an inspiration to me and all horse lovers a like. Keep up the great work! Marilyn S.
Thanks so much for taking the time to write. I’m so glad my Almanac has helped inspire you to continue to reach for your dream. I’m happy to share what I have been fortunate to experience and learn about horses and their care and training. The Almanac, which was published in 2007, was a perfect medium to be able to paint the whole year round picture here at Long Tail Ranch. And thanks also for your encouragement to keep up the work ! The art of writing is applying the seat of the pants to the seat of the chair and sometimes that keeps us writers out of the saddle more than we like ! But there are several new books in the works – one which I am just finishing up the final touches on and will be out in a few months. I’ll post information about the new books when they become available or you can visit Chronology of Books and Videos by Cherry Hill – the newest ones are at the top of the left column. Expansion” can refer to several aspects of a hoof. Here it defines the difference in width between the shoe and the hoof as seen when looking down at the hoof with the foot on the ground. Expansion is the amount of shoe that extends past the sides of the hoof at the heels. The shoe should fit flush with the hoof from the toe around to the quarters (the widest part of the foot) and then be wider than the hoof (when the horse is freshly shod) by at least the thickness of a dime. You can check for expansion by running the point of the pencil around the edge of the shoe from the quarters to the heels: if there’s no shoe edge for the pencil to ride on, there’s no expansion room. Expansion room gives the hoof somewhere to go as it changes shape. With each step a horse takes, the heels of the hoof move outward under the horse’s weight. As the foot is lifted, the heels return to their original position. You can usually see evidence of this repetitive heel movement in the form of grooves or shiny areas at the heel area on the hoof surface of a shoe that’s been removed. Also, because the hoof is cone-shaped, the base of the hoof gets wider as the hoof grows longer. But the steel shoe nailed to the hoof remains its original width. If the shoe is fit too close, with no expansion room at the heels, or if a properly fit shoe is left on too long between shoeings, the hoof wall usually spreads over the edge of the shoe as it grows. When this happens, the reduced bearing surface area of the hoof at the heel is often crushed under the weight of the horse. Then when the hoof is prepared for his next shoeing, the heels have to be trimmed excessively low to get a solid bearing surface. The best shoeing job in the world is worse than worthless if let go too long; letting the hoof grow over the shoe is a direct route down the slippery slope to a Long Toe/Low Heel configuration. Like extending the heels of the shoe, leaving generous expansion room carries a certain amount of risk: a horse could step on the exposed shoe and pull it off. Upright hooves need less expansion room and can be shod fairly close, while more sloping, spread-out hooves need to be shod “full” with plenty of expansion. Also, a wide foot can be shod like a flared foot (they are often one and the same), with side clips to contain the hoof and prevent it from spreading over the shoe. The average shoeing cycle ranges from 5 to 8 weeks. A farrier must determine by experience how much expansion room to leave for each hoof. Just the right amount of expansion will result in the hoof growing to the edge of the shoe but not over it at the end of the shoeing cycle. In fact, this is one of the best ways to determine the length of your horse’s shoeing cycle: when the hoof grows flush with the edge of the shoe, it’s time for a reset, if the hoof has grown past the shoe you’re horse is overdue. The above tips are general guidelines for assessing your horse’s shoeing. Every hoof must be shod as an individual, taking into consideration the horse’s conformation, movement, habits, management and intended use. If the shoeing on your horse varies significantly from the guidelines in this article, or if you have questions about the way your horse is being shod, discuss them with your farrier. A good shoer will not be offended by straightforward questions and should be able to explain in terms you can understand why he’s shoeing your horse in a particular manner. The owner is ultimately the person responsible for providing the horse with proper hoof care. If your shoer is unwilling or unable to provide satisfactory answers to your questions, that may be reason enough to think about putting your horse’s feet in the hands of another farrier. The hoof is a plastic structure, that is, stress can cause it to change shape. A hoof is strongest when the entire hoof wall from the coronary band to the ground is straight, without flares. 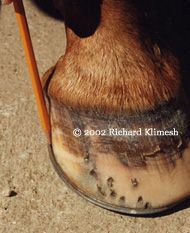 A flare is a concave bend, or dip, in the hoof; a flare at the toe is called a dish. Flares weaken the hoof wall and can lead to cracks. A dished toe can affect a horse’s movement and long term soundness by causing the toe of the shoe to be too far forward. This makes it more difficult for the hoof to break over and can cause forging (hitting of the front shoes with the hinds) and more serious problems like those caused by Long Toe/Low Heel. Flares can result from hoof imbalance, poor genes, inadequate nutrition, too much moisture, or most likely, a combination of these factors. Serious flares are easy to see, but early flares are not as obvious. 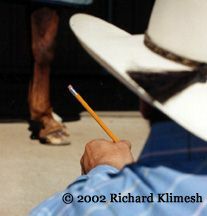 To check if a hoof is developing a flare or dish, lay a pencil against the hoof wall. Space under the center of the pencil indicates a flare or dish. Most hooves tend to develop flares and dishes to some degree but they can usually be kept in check if a shoer takes the time to “dress” the hoof wall straight with a rasp every time the horse is trimmed. This doesn’t mean the entire wall is indiscriminately rasped – only where a flare or dish is forming. Even neglected feet that have developed wide flares or deep dishes can be improved dramatically with one trimming and gradually retrained with regular care. In order to control flares, the bottom of the hoof where the flare was located is sometimes sculpted out, or “relieved”, with the rasp so that the hoof at that area bears no weight. This removes the bending forces on that portion of the hoof so new hoof horn grows down straighter. Another approach is to rasp the flares to about half the thickness of the hoof wall and apply a shoe with side clips located at the flares. The clips prevent the hoof from flaring and encourage the hoof wall to grow down straight. Whether or not flares are kept under control by careful shaping of the hoof often tells the difference between a “good” shoer and a “fast” shoer. Note from Cherry: While I am away on business, I’ve invited Richard to blog in my stead……watch for the next 2 parts to this article series. Your hoof care program affects your horse’s immediate performance as well as his long-term soundness. You might not think you need to pay much attention to your horse’s shoeing as long as your horse is sound and his shoes don’t fall off. The good news is that horses are very adaptable and they can often tolerate poor hoof care for months or even years; the bad news is that by the time signs of lameness appear, irreparable damage might already be done. Shoeing methods used to keep shoes on at all costs often ignore critical shoeing principles and might end up putting your horse out of commission for good. Guidelines for judging the quality of a shoeing job can include such details as how neatly the frog is trimmed, the size of the clinches and how far the nail heads protrude from the shoe. Details like these are important to some degree, but usually are not critical to your horse’s soundness. There are a four very important aspects of shoeing, however, that you can readily evaluate: balance, shape, support, and expansion. All you need is a pencil and a safe place to tie your horse on level ground. It’s best to evaluate a shoeing job within the first week or two. Hoof balance includes many aspects of a horses conformation and movement and has been discussed at length in many books and articles. One type of balance, however, is relatively easy for anyone to quickly assess: it’s called Dorsal-Palmar (DP) balance. DP balance refers to the alignment of the hoof and the pastern. DP balance can be measured as the hoof angle at the toe. The hoof angle is the relationship between the front (Dorsal surface) of the hoof and the ground (Palmar surface of the hoof). For years, books cited 45 to 50 degrees as a “normal” front hoof angle and 50 to 55 for hind angle. Today, it is generally agreed that in reality these angles are far too low. A more representative range of hoof angles is from 53 to 58 degrees for the fronts and 55 to 60 degrees for the hinds. Keep in mind, however, that every horse has his own “ideal” hoof angle. The hoof angle is considered correct when the hoof and pastern are in alignment, that is, when the front surface of the hoof is parallel to an imaginary line passing through the center of the pastern. To check the alignment of the hoof and pastern, make sure the horse is standing square on a firm level surface with his cannons perpendicular to the ground. Move 8′ to 10′ from the side of the horse and crouch down to view the feet. Hold a pencil at arm’s length and line it up with the center axis of the pastern. The front of the hoof should be very close to parallel with the centerline of the pastern. If the hoof angle is too low, the center line, or axis, will be “broken back” where the lines of the hoof and pastern meet. If the hoof angle is too high, the imaginary line will be “broken forward”. Of the two, a broken-back axix is more common, and more harmful. A low hoof angle usually indicates a Long Toe/Low Heel hoof configuration. LT/LH can cause excess tendon stress, heel soreness, cracks, bowed tendons, contracted heels, navicular syndrome, and under-run heels. (Under-run heels refer to heels that have an angle lower that the toe of the hoof by 5 degrees or more. Under-run heels slope under the hoof and in severe cases can appear to approach the horizontal.) Even when a foot is in perfect balance when shod, the angle almost always gets lower as the weeks go by because the toe grows faster than the heels and the shoe prevents the toe from wearing away. This is one reason to have the feet trimmed and rebalanced on a regular schedule. A barefoot horse actually might have a better chance of maintaining DP balance, especially if allowed to move freely over dry ground so the hooves can wear naturally. If the hoof can’t be balanced by trimming, the heels can be built up with a hoof repair material, or wedge heel shoes or pads can be used to elevate the heels and align the hoof-pastern axis. Note from Cherry: While I am away on business, I’ve invited Richard to blog in my stead……watch for the next 3 parts to this article series.